If you're looking for Colorado mountain homes for sale, or mountain cabins for sale in Colorado, then you've found the best and most comprehensive resource for Colorado mountain homes available. 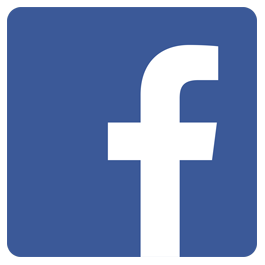 Featuring listings of the best Colorado mountain homes for sale and mountain cabins for sale and specializing in Summit County real estate in the heart of ski country Colorado. Whether you're seeking investment homes for sale in Breckenridge Colorado, or personal family retreat homes in the Colorado mountains, Patty Whetham is the top realtor in Summit County to help you find the Colorado mountain home of your dreams. 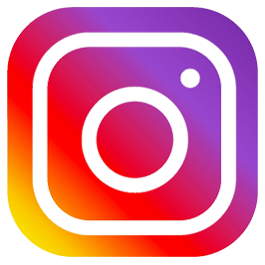 Your Summit County Colorado real estate and Breckenridge Colorado real estate specialist. Latest statistics now available from the Colorado Association of Realtors. Mountain statistics include Summit County (Breckenridge, Frisco, Silverthorne, Keystone, Dillon and Copper Mountain) as well as Aspen, Glenwood, Grand County, Gunnison, Steamboat, Telluride and Vail. Summary statistics are definitely helpful in determining market trends. This time of year is typically a bit slow in the area, but statistics are positive that we're trending up in both sales transactions and price. If you're interested in purchasing a mountain investment home, it would be good to start looking and be ready to go as we move into the main selling season (typically July - September for mountain regions). Call me and let's talk. Like many of the other great Colorado mountain towns, Dillon has many great things to offer. This is why homes for sale in Dillon, Colorado often sell so quickly! With a community that is tucked into the glorious Rocky Mountains, yet a reasonable drive to the big city of Denver - Dillon has it all! 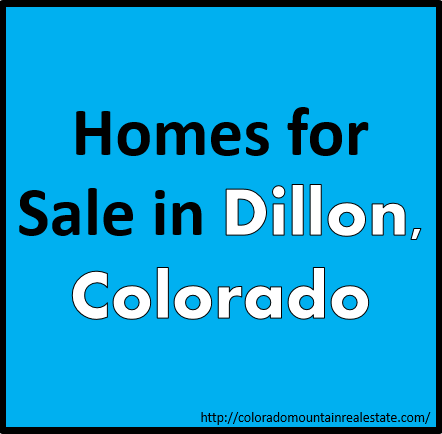 Here we will share why you should be considering the homes for sale in Dillon, Colorado. Most people think of the winter months when they picture mountain towns of Colorado. However, the summer months can be just as great. Dillon is known for its first rate farmers' market! Imagine being able to take all the fresh produce and goodies to your new home! The performing arts and Summit Historical Society also offer great activities year round. The Dillon Marina and Reservoir have some of the best fishing in the area, so definitely make sure to check that out once you've moved into one of the homes for sale in Dillon, Colorado. Dillon obviously offers many of the great winter activities you've come to know and love from the Colorado mountain area - skiing, snowboarding, snowbiking, cross country skiing, and more! After you've purchased one of the homes for sale in Dillon, Colorado, you'll be able to enjoy these activities - and the amazing views these activities offer - any time you want! And don't forget about the performing arts or the historical society that offer great year-round options as well. If the above information sounds interesting to you, give Patty here at Colorado Mountain Real Estate a call today. She will help you locate one of the perfect homes for sale in Dillon, Colorado. Whether you plan to live here full time or rent the property out as a vacation rental for the portion of the year when you're not here, she can help you out. Your expert in Dillon, Colorado real estate. Contact her today! When many think of the Rocky Mountains of Colorado and the homes for sale, Beaver Creek may not be the first place that comes to mind. However, it should be! Beaver Creek is the hidden gem in Eagle County, Colorado. There are plenty of homes for sale in Beaver Creek, Colorado. Let's go through some of the many reasons you should be considering the homes for sale in Beaver Creek. Have children? Many of the activities above are kid friendly, but there's also the local children's museum. With interactive attractions, your kids will love visiting! And make sure to check the Children's Theatre Company. They have great performances that the kids will love, but so will the adults! If you're looking for one of the homes for sale in Beaver Creek, Colorado, chances are that you already know about the wonderful views the Rocky Mountains offer. Well, Beaver Creek is no exception! Let Patty here at Colorado Mountain Real Estate know the kind of homes for sale in Beaver Creek that you are looking for, and chances are she'll be able to find you something in your price range AND with the beautiful view you are expecting! Patty's knowledge of the area and willingness to do more searching for the ideal home for you will leave you completely satisfied. Check out her reviews on Zillow.com and then contact her today to help find the home you've been looking for! Copper Mountain is the small, mountain town with it all! 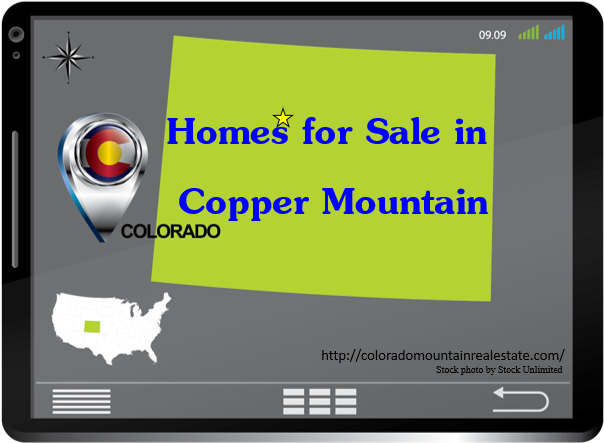 It's no wonder homes for sale in Copper Mountain, Colorado sell so quickly! When you have some of the world's best skiing in your backyard, that's one thing. But add in great shopping, dining, a tubing hill, a 12-month snowboarding facility, fantastic athletic club, and year-round events - and you've found what could be argued the best home on earth! Oh, and let's not forget about the sleigh rides, snowmobile or snow cat tours, dog sledding, or zip line! When you purchase one of the homes for sale in Copper Mountain, Colorado, you are set to have a lot of great activities happening right in your backyard every single day. Plus, let's not forget that you're only an hour away from Denver and all that it has to offer. Add in the other area mountain towns, and you'll be able to stay busy every night of the week if you'd like. Perhaps the relaxed, laid-back atmosphere is more your style. No problem! Many of the homes for sale in Copper Mountain, Colorado, offer great privacy in the mountain climate. While you'll be able to partake in any of the activities listed above, you'll also be able to simply relax and enjoy the breathtaking views that only the Rocky Mountains of Colorado can provide. Homes for sale in Copper Mountain, Colorado, offer the best of both worlds. Enjoy staying busy and being on the go, or simply lay back and enjoy all that this glorious mountain life has to offer. Either way - we know you'll be pleased with the property you choose from the homes for sale in Copper Mountain, Colorado. Contact Patty here at Colorado Mountain Real Estate today. She can help you find the property you've been dreaming of. Whether you want something to live in full-time, or a vacation property to visit several times during the year - Patty can help. Contact her today! When you think of homes for sale in Silverthorne, Colorado, we're guessing trees and snow-covered mountain caps come to mind. Trust us, there are plenty of great snow adventures waiting for you if you're ready to purchase one of the homes for sale in Silverthorne, but there's much more available here as well. The outlets in Silverthorne are amazing! With hundreds of stores to choose from in three convenient village location, you're sure to find just what you're looking for. Plus, prices are as much as 70% off! Who can resist that? Did we mention the free shuttle as well? Yep, it's pretty amazing! Anglers - both novice and professional - enjoy coming to the Blue River to get their fishing fill. While fly-fishing in the favorite, you can have decent luck with a lure as well. Come on down to the banks and give it a try! Hopefully you have such great luck that after you've bought one of the homes for sale in Silverthorne, Colorado, you'll catch enough fish to feed the entire family! Many have found that it's cheaper to rent skis right in Silverthorne than it is on the mountain. So don't wait until you're on the ski slopes. After you've perused the homes for sale in Silverthorne, sealed the deal, and moved in - take your first trip down the mountain! Just make sure to rent your ski equipment directly in Silverthorne before you go. With over 50 restaurants, bars, and other options, you're sure to find a great place to eat, drink, or gather once you've purchased your Silverthorne home. Unpack in your recently purchased home, and go enjoy one of the many great dining options. Make sure to contact Patty here at Colorado Mountain Real Estate if you'd like to learn more about the homes for sale in Silverthorne, Colorado. She has great knowledge of the Silverthorne area, and she's happy to help you out! Your Silverthorne, Colorado real estate expert. When looking for homes for sale in Keystone, Colorado, there is much to consider. Do you want a condo or a house? How close does your property need to be to the ski slopes? What is your budget? Which area of Keystone do you want to live in? When considering the homes for sale in Keystone, it's important to know that this quaint little town is tucked into a valley. If you're looking for an "alpine" feel, you've come to the right mountain town! Choose which of the five main parts of Keystone you'd most prefer to live in: Lakeside Village, Keystone Ranch, Mountain House Area, East Keystone, or River Run Village. Each offers something unique and is important to consider when looking at homes for sale in Keystone. Regardless of what you're looking for, chances are that Keystone, Colorado, has it! From the breathtaking mountain view to the friendly resort, Keystone has many activities to keep you and your family busy. Or you can simply sit back in your new home and enjoy the views. Plus there are other resorts that are a quick 20 minutes away, many with free shuttle services. You could spend much of the winter months hopping mountain to mountain if you wanted to. With a population of just 1,000 people, you're going to get a small town feel, but yet there are the amenities that make this feel like a bigger city. And, if it's still not big enough for you, remember that Denver is just a quick drive away! This is part of the appeal about the homes for sale in Keystone, Colorado. If you're looking for homes for sale in Keystone, Colorado, you've come to the right place! Patty is knowledgeable about the entire Summit County area. She can tell you if the homes for sale in Keystone are a good fit, or if another community would be more your style. Simply give her a call today and let her do the rest. You'll be looking at your dream house in no time! Whether you want to live there full-time or make it a vacation rental that you only use several times a year, it's possible. Your Keystone Colorado real estate expert. Don't wait! Contact Patty today! 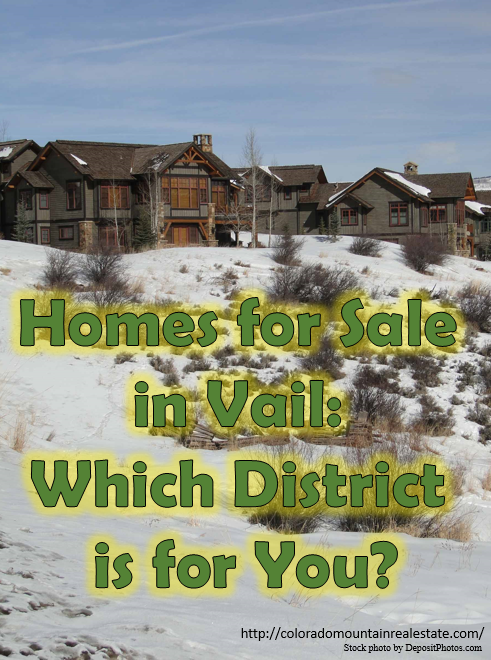 Homes for Sale in Vail: Which District is for You? When you think of homes for sale in Vail, Colorado, you may not realize how many different districts are in the community. It can be an intimidating process when you first get started. There are ten different areas where you may want to purchase one of the homes for sale in Vail. 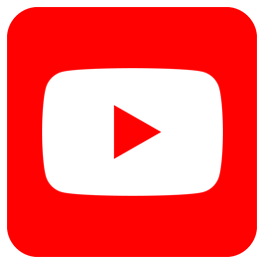 Here we will give you a brief overview of each one. East Vail is known for its single-family homes. It can be accessed via the East Vail I-70 Exit. The Golf Course district is the area to find low density homes. You can get to it via the Vail or East Vail exits. Golden Peak is home of multi-family homes. Access if via the Vail I-70 exit. Vail Village houses many retail facilities. It is also home to the Colorado Ski Museum. Ski lifts can also be accessed from here. The business district has many offices, the hospital, banks, city government offices, and some low density homes. Use the Vail Exit to access this portion of town. Lionshead is the mountain portal. Ski lift access for Eagle's Nest and Adventure Ridge mountain can both be accessed here. The library, ice arena, and public parking can also be found via the Vail Exit on I-70. Sandstone houses a mix of retail offices, a grocery store, post office, graduate school, and a variety of homes. EverVail and Cascade Village are both home to the mountain portal and resort. Many of the homes for sale in Vail are located here. West Vail is known primarily for its single-family homes. It can be accessed via the West Vail exit on I-70. As you can see, there are a variety of options when looking at homes for sale in Vail. It can be a daunting task to decide which area you want to live in. It's great to find a real estate agent who knows the area well. This is why you should go with Patty here at Colorado Mountain Real Estate. She has a great record for helping customers find the home they've been searching for when considering homes for sale in Vail. Contact her today to get started finding your next home or vacation getaway property! Your Vail, Colorado real estate expert. 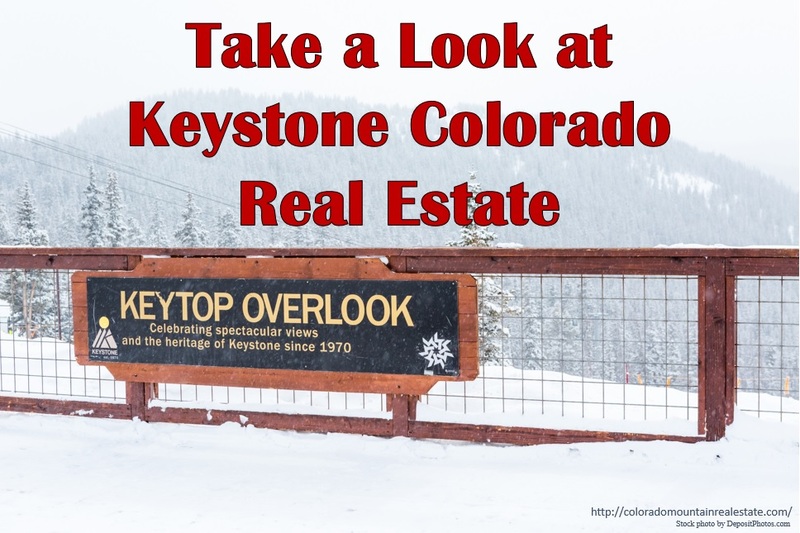 Ready to take a look at Keystone Colorado real estate? Since Keystone is located just a few miles off of I-70, it's an easy trip into Denver whenever you get the huge to take in some of the bigger city. We're sure you're going to love the many activities in the area as well, so let's get started! There are three mountains within Keystone Resort. They are the Outback, North Peak, and Dercum Mountain. And let's not forget the five bowls too! Skiers at every level will have a great time. There are 20 ski lifts to connect the area, so lines are at a minimum. Plus Keystone has the largest operating night skiing in Colorado. You can also go cross-country skiing as well. But that's not all! Keystone is home to the #1 ranked Colorado terrain park, A-51 (as ranked by snowboarding magazine Transworld SNOWboarding). It's overall rank is #4 in all of North America. And let's not forget about the largest zambonied skating rink in North America. Plus many four and five star restaurants! The summer months bring a widely different activity base, but you'll still love the many options the Keystone Colorado real estate area has to offer. There are literally hundreds of miles of mountain biking trails. Add in some great hiking trails, and even some of the best-known fly fishing in all of Colorado. Other great Keystone Colorado real estate activities include horse stables, ATV tours, water tubing, and much more! The views in Colorado are simply breathtaking, regardless of what time of year you visit. That's probably our favorite thing about Keystone Colorado real estate. What are you waiting for? 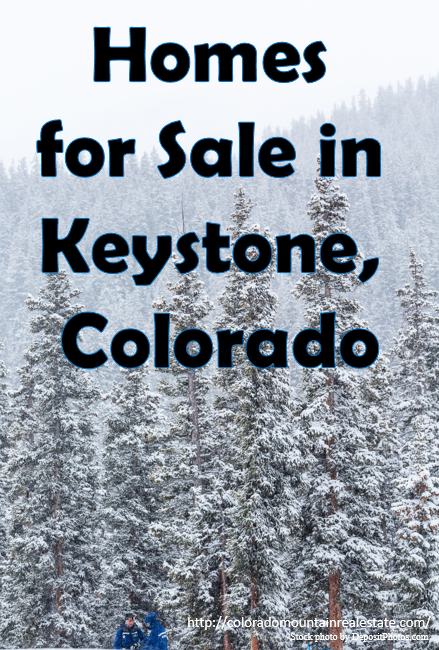 Patty here at Colorado Mountain Real Estate would love to help you find your next Keystone Colorado real estate property. Whether you're looking for a year-round home or a vacation rental, she can help. Patty has years of experience in the Summit County real estate arena, and she would love to help you out. Contact her today! Silverthorne, Colorado is a unique community. That's part of what makes Silverthorne Colorado real estate so appealing. The town was only incorporated in 1967, but much as changed since then. The community was first a construction camp for those working on Dillon Dam. Then it had one convenience store. Now, in 2015, it has roughly 4,000 full-time residents. 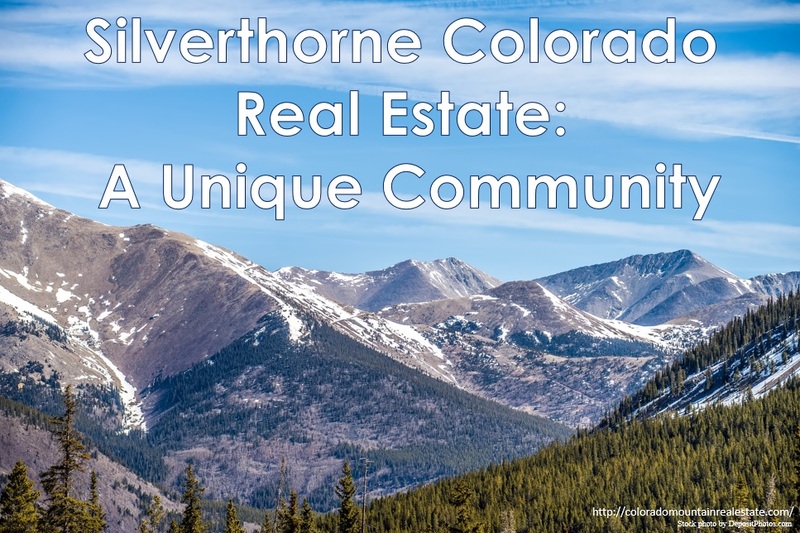 Located about 70 miles west of Denver, Silverthorne Colorado real estate has an elevation of nearly 9,000 feet. Two sides of this mountain town are surrounded by the forests that help make up the Rocky Mountains. Some call it "The Gateway" because of Silverthorne's location as the beginning of Summit County and much of western Colorado. With five ski resorts within a half-hour drive, it's no wonder Silverthorne, Colorado is such a hot spot for tourists. Some of these tourists choose to buy a vacation home and rent it out when they're not there. However, there are many who like to call this area home year-round as well. When you purchase Silverthorne Colorado real estate, you can rest assured that you will get the most out of your money. This unique community continues to evolve and change, so it will be interesting to see what else the future holds. 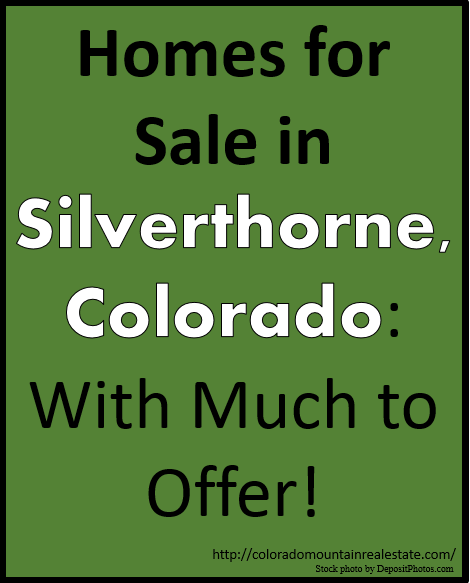 Wondering what else Silverthorne Colorado real estate has to offer? Plenty! How about a trout stream right through town. Or perhaps an 18-hold golf course is more your style. Your children might enjoy the skateboard park. The entire family can enjoy the volleyball courts, tennis courts, swimming pools, and soccer field. And let's not forget about the shopping! There are over 100 retail shops located right in Silverthorne. Add in over 20 restaurants, and you're sure to find something that everyone in the family can enjoy! Loving what you're hearing? Great! We think Silverthorne Colorado real estate is worth looking into for anyone who is considering Rocky Mountain living. Please contact Patty today so she can help you find the perfect Silverthorne Colorado real estate property for your needs! Want even more information? Check out this site to see the most up-to-date profile about Silverthorne, Colorado. 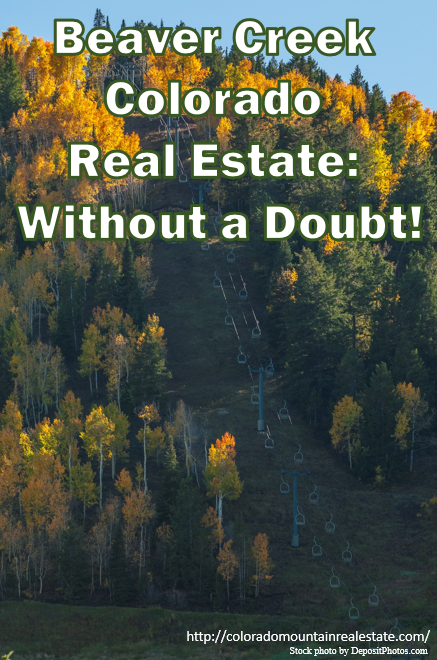 Beaver Creek Colorado Real Estate: Without a Doubt! Choosing Beaver Creek Colorado real estate is, without a doubt, an easy choice! If you've been looking for a home in the Rocky Mountains, you're going to love Beaver Creek. Let us tell you exactly why Beaver Creek Colorado real estate needs to be at the top of your list when you're looking for your next mountain home. Like many other small Colorado mountain towns, Beaver Creek has great hiking trails and mountain biking areas. They also have great golf courses, and you can do 4x4 or 4-wheeler rides as well. Do you think those ski lifts are just for wintertime? Think again! The views from a ski lift during the summer months are simply breathtaking. And don't forget that you can get in a few rounds of tennis if that's your style. Have children? No problem! Beaver Creek has some great kids activities during the summer months as well. They can go gem panning, check out the children's museum, climb the rock wall (although the adults will love that as well! ), or bounce around on the bungee trampoline. And don't forget about a round of miniature golf for the entire family! Beaver Creek is known for some of its great summer traditions including rodeos, movies under the stars, its 4th of July celebration, and its annual Blues, Brews, and BBQ Festival. When you buy Beaver Creek Colorado real estate, chances are you'll be spending at least part of the winter months here as well. Some choose to rent out their homes since they buy it as a vacation property. Whether you live here year round or simply come to visit, you know skiing, snowmobiling, snowboarding, snowshoeing, and tubing are just a few of the winter favorites. If these activities sound worthwhile, then Beaver Creek Colorado real estate is for you! 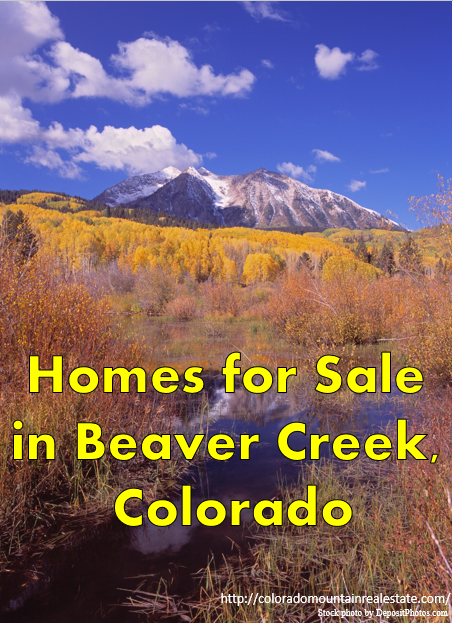 Contact Patty here at Colorado Mountain Real Estate to find out what homes are currently available in the Beaver Creek Colorado real estate area. Patty has great knowledge and would love to help you find your next mountain property.